Long serving CEO of the Research and Education Network of Uganda (RENU), Eng. Isaac Kasana, has retired from the position after almost six years of service. The Board of RENU has since appointed Chief Technical Officer, Nicholas Mbonimpa as Acting CEO, replacing Eng. Kasana who retired from the position on 31st December 2018 after taking up the post in June 2013. Eng. Isaac Kasana, a serving member of UbuntuNet Alliance Board of Trustees, was given a hearty send- off by staff and representatives from stakeholders at the RENU offices in Kampala where he was decorated with gifts and warm farewell speeches. The outgoing CEO has been at the fulcrum of the progress and achievements that have made RENU one of the most modeled after NRENs on the African continent. Under his leadership, RENU achieved a 90 percent bandwidth cost reduction for member institutions having brought down the bandwidth unit price from USD 630 in 2012 to USD 60 in 2018. 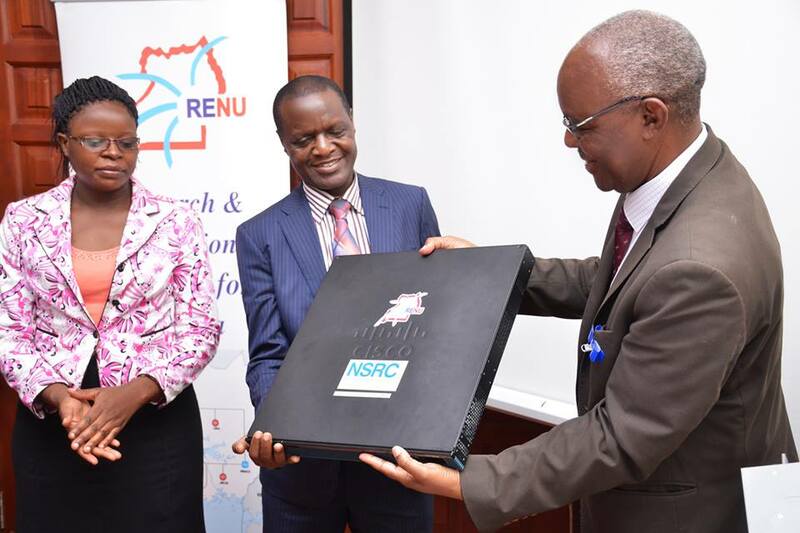 In terms of service deployment and offering, RENU has been one of the most progressive NRENs under Eng. Kasana as it became one of the earliest networks to adopt and implement eduroam and its Identity Federation one of the few African federations to joining eduGain. RENU also continued to organise and host a series of engineer capacity building initiatives that have trained hundreds of engineers from member institutions. “I will remember my time at RENU for the successful development of a community of collaborating R&E institutions, now in excess of 60, who value the services the NREN provides to them as well as for the evolution of a team of young professionals who are very passionate about effectively supporting the Uganda NREN community and also for our establishment of a vibrant technical capacity development programme and the very productive and strong partnerships that RENU now enjoys with a number of national, regional and international organizations such as UCC, UVCF, CUUL, UA, RUFORUM, NSRC and NorduNet . We also need to mention the development of a countrywide network providing both paid and many free services to member institutions, which was done using mostly RENU- generated funds,” said Eng Kasana. Eng. Kasana then paid special gratitude to UbuntuNet Alliance saying the Alliance has been critical in the success of RENU. “RENU’s partnership with UbuntuNet Alliance has been crucial in ensuring that RENU is providing affordable international bandwidth and the Alliance has greatly assisted in the initiation of the network engineer capacity building programme through its Training of Trainers (ToT) programme and linking RENU to partnership opportunities with both the regional and the international R&E communities and assisting the evolution of R&E collaboration activities across the African continent and with other RREN,” he said. The outgoing CEO, who plans to help to initiate the development of an African Centre for Appropriate Innovations that can support private tertiary institutions to more effectively contribute to the acceleration of social economic development called on the government of Uganda to recognise the contribution of RENU and support the NREN while allowing it to remain independent. UbuntuNet Alliances wishes Eng. Kasana all the best in his future endeavors and continued personal health.